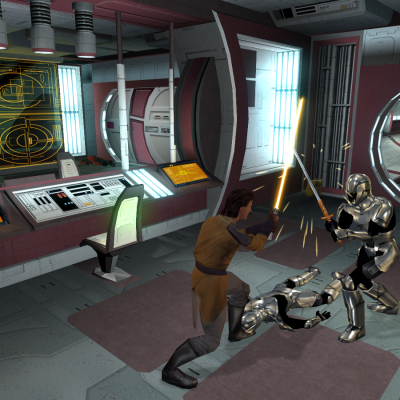 A Mod for Star Wars Knights of The Old Republic Author: N-DReW25 Release Date: 8.10.2016 1.1 Release Date: 24.04.2017 Installation: Simply Copy and Paste or Drag and Drop ALL the files within the "For Override" into your Star Wars Knights of The Old Republic override folder Uninstallation: Remove or Delete the files from your Star Wars Knights of The Old Republic override folder Description: In May 2016 I created a mod called Dark Jedi Icon Fix that turns the Dark Jedi Knight and Master robes into there correct icon though recently I figured out a way to make the Dark Jedi Robes match their original icons so what this does is change the Dark Jedi Knight and Master robe texture to look like there original icons. In 1.1 I have included the female robe texture Known Bugs: Though this is my First Retexture Mod this mod shouldn't have bugs but if there is Just PM me on Deadlystream. 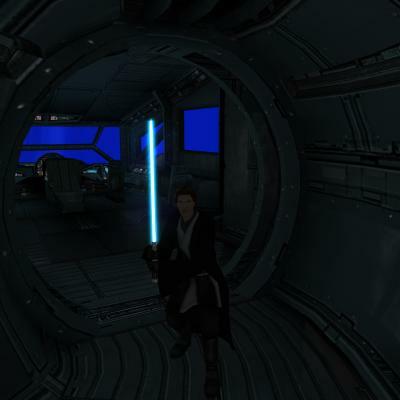 Incompatibilities: Will be incompatible with anything that changes the Dark Jedi Robe and Dark Jedi Knight robe texture this includes any robe reskin mod. Upcoming: The Female version of the robe Possibly make the rest of the robes like the Dark Jedi robe Permissions: You may NOT claim this mod as your own. 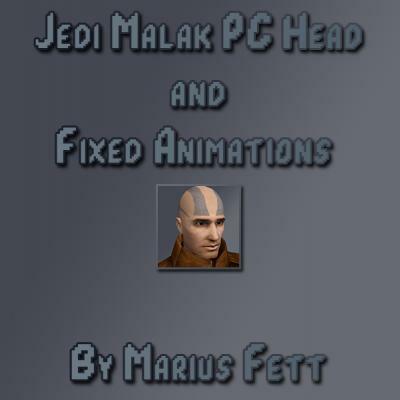 Thanks: Bioware for such an amazing game, Fred Tetra for Kotor Tool, Gimp and everyone who downloads the mod. 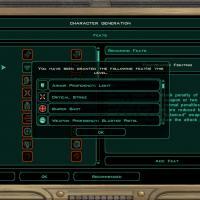 Legal: THIS MODIFICATION IS NOT SUPPORTED BY BIOWARE/OBSIDIAN ENTERTAINMENT, LUCASARTS, DISNEY OR ANY LICENSERS/SPONSORS OF THE MENTIONED COMPANIES. USE OF THIS FILE IS AT YOUR OWN RISK AND THE ABOVE MENTIONED COMPANIES OR THE AUTHOR IS NOT RESPONSIBLE FOR ANY DAMAGE CAUSED TO YOUR COMPUTER FOR THE USAGE OF THIS FILE. 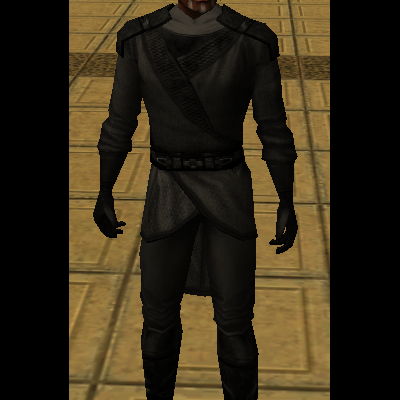 I looked over my Gray Jedi Robe mod and noticed you don't get it for a while in the game, so I decided to make a mod that gives the Exile some clothes to match the robe (before you get the robe itself). These do have stat upgrades so that way you can power on through Telos. They are found on the Harbinger when you get to your quarters. 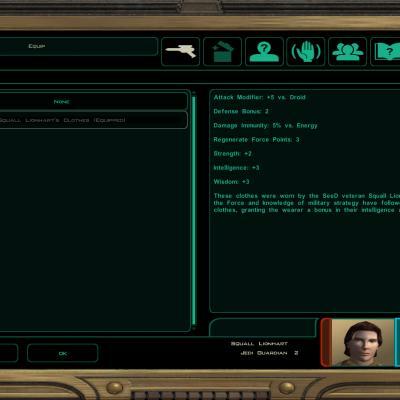 Installation: Drag files to Override Please make a backup of your Kreia.dlg file, as this does contain the script to fire when you enter the Harbinger. 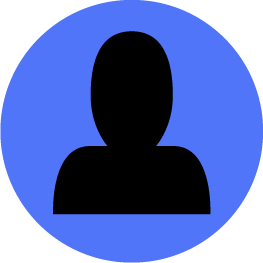 Bugs: None known, PM with any and I will see what I can do. Minutes ago I am having this abstract thoughts. If the Jedi have their own code: There is no emotion, there is peace. There is no ignorance, there is knowledge. There is no passion, there is serenity. There is no chaos, there is harmony. There is no death, there is the Force. And the Sith: Peace is a lie, there is only passion. Through passion, I gain strength. Through strength, I gain power. Through power, I gain victory. Through victory, my chains are broken. The Force shall free me. Is there any "cult(s)" in Star Wars franchise with a code that is in between these two? 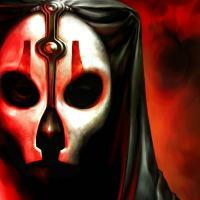 I'm a rookie in Star Wars thing [the first time I'm into Star Wars was when playing KotOR, which is about early March this year I believe], not many things I know beside the fact that there are the Sith and the Jedi. Actually, because of this thoughts I kind of wanting to start a mod [in the future- there are still unfinished projects now; sorry peeps 😛] that create an NPC(s) that represents this "in between" faction. Moments ago, I googled searching the fact for "do Heaven and Hell exist in Star Wars?" to at least, legitimate-check it. And the result; it does- point to this reference. So, using that as starting point I concreted these random words that is coming out of my head to be a "code" and name the "cult"; the Unknown. Believe in there is no Heaven nor Hell. Believe in their existence. Believe in there is something in between. Believe in the Unknown. Maybe one of you reading this could tell me if there are already factions that is beside the Jedi and the Sith, because this idea kind of bugging me now [the idea of start a story about the Unknown to tell the truth 😛, but maybe if you are interested on kick-start this concept; knock yourself out! ] Again, thank you for reading this [if you have been reading this]. And I am sorry- for the inconvenience may I have caused from this writing. May the Force be with you! 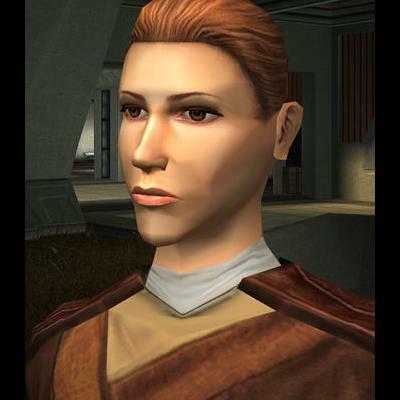 ------------------- Kill Belaya v1.1 ------------------- Author TheRealDarthRevan Updated at 12:47 on Friday the 14th of July 2017 ----------- DESCRIPTION ----------- You know how when you kill Juhani as a dark jedi on Dantooine and when you arrive back at the Jedi Enclave you are confronted by Juhani's 'friend' Belaya, she says she wants to kill you. Now you can kill Belaya BEFORE Korriban and get some custom loot. This mod is in it's early stages, there will be more content to come. 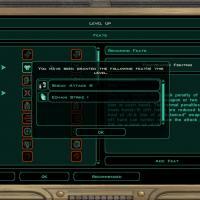 ------------- INSTALLATION ------------- Just run the TSL patcher and you're set. If TSL Patcher somehow does not work for you copy the contents of the TSL Patcher folder(excluding info and changes)into your Override folder. -------------- COMPATIBILITY -------------- This mod is fully K1R compatible and should be compatible with any mod unless it edits 'dan13_belaya' dialog and charactor utc. 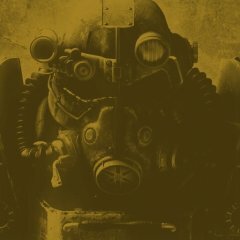 If there is a specific mod it is incompatible with PM me and I will work to get it compatible. ----- BUGS ----- None that I know of, this is a simple mod so there shouldn't be any bugs, but if you do find some PM me and i'll try to fix it. 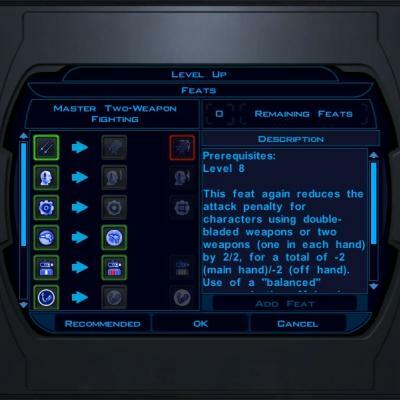 ------- THANKS ------- Thank you to Fred Tetra for KotOR Tool Bioware for making an AMAZING Star Wars game The Deadly Stream community and all those tutorials. -------- LEGAL -------- THIS MODIFICATION IS PROVIDED AS-IS AND IS NOT SUPPORTED BY BIOWARE OR LUCASARTS OR ANY LICENSERS/SPONSORS OF THE MENTIONED COMPANIES. USE OF THIS FILE IS AT YOUR OWN RISK AND THE ABOVE MENTIONED COMPANIES OR THE AUTHOR IS NOT RESPONSIBLE FOR ANY DAMAGE CAUSED TO YOUR COMPUTER FOR THE USAGE OF THIS FILE. This mod provides darkside players with a means of training Hanharr as a dark jedi guardian, it branches off of the part where you "break" him. it also includes a new skin, portrait, and if it works correctly, when you train him his appearance should change. The read me says it requires TSLRCM 1.8.1 but anything newer should work too.